When you are an entrepreneur, work happens everywhere- in the car, at the kitchen table, even in your bed! 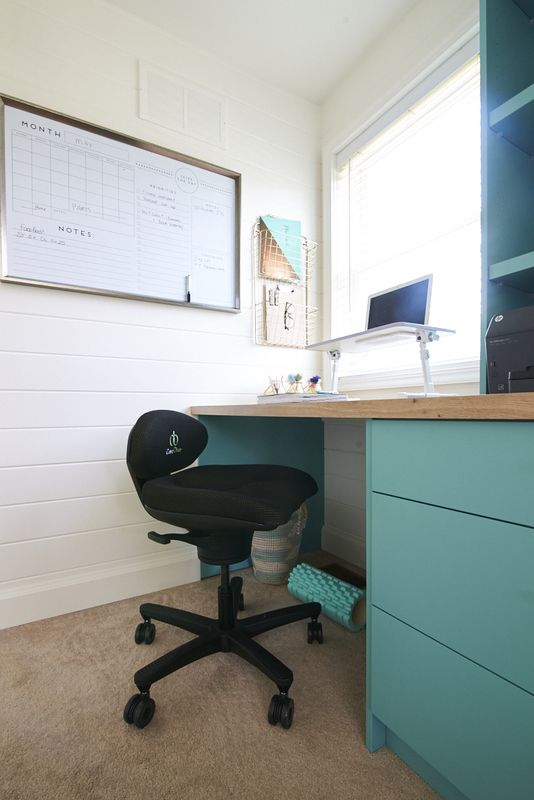 But there eventually comes a point when it is time to create a dedicated office space for everyone's sanity and productivity- and that is exactly what I did for entrepreneurial mom of 2, Jennifer Pike. To know Jenn Pike personally is to constantly be inspired to be more healthy (she is an incredible women's health and wellness expert). 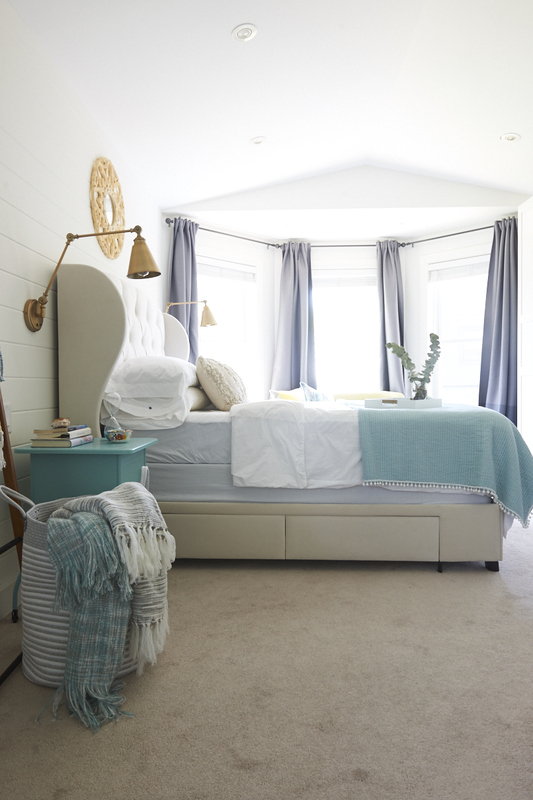 So of course in her master bedroom, we invested in amazing materials to increase healthy sleep habits, proper spine alignment, and more- and I am so excited to share it all with you! If you prefer to watch, click on my YouTube video below, otherwise read on! I'm a big believer that all hard working mamas DESERVE a beautiful bed. After a hard day of raising kids, working outside the home, working inside the home, whatever it is you do- MOMS (AND DADS) ARE TIRED. So let's invest in a BEAUTIFUL bed. And this Wayfair bed does not disappoint. Both Jenn and I are pretty time strapped between our entrepreneurial and family activities. So the ability to shop online, and have delivered quickly a major design element of the room, is so strategic for us! 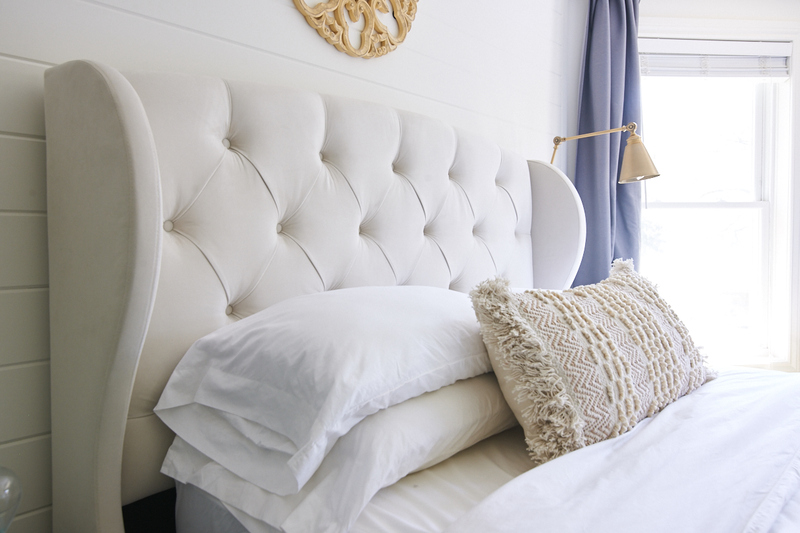 This bed is soft, plush and elegant- I love the tufted headboard and the drama the wingbacked headboard possesses. And as I have shared in my past projects I have done with Jenn (check out her laundry room and her kitchen), this house has such limited storage (no garage, no basement). So any opportunity I could find to give her additional storage I did- including in the bed! And finally, of all the pieces in the room, this one for sure is my favourite in the category of value obtained for dollars spent. 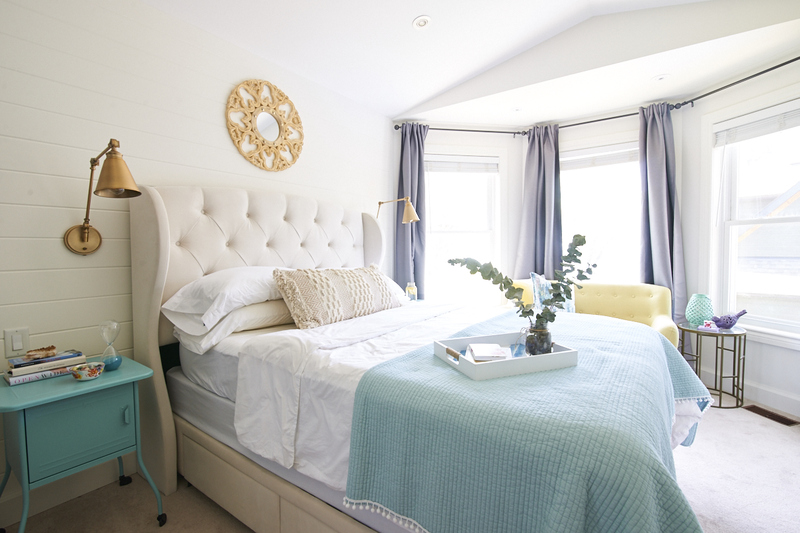 I have spent upwards of $4000 on custom upholstered beds like this with storage- and so get something like this for less than $2000 all in is just fabulous. And of course a beautiful bed needs a quality matress. For the mattress and sheet set, we used The Casper Mattress. Again, ergonomic health is a major priority to Jennifer- so selecting the right mattress for her and her husband was really important. This mattress offers ZonedSupport, an innovative foam framework that contours specifically to each area of the body for incredible comfort, ideal anatomical support, and focused spinal alignment. This award winning mattress boasts four supportive layers of high-density memory foam to provide balanced support. And for the pillow, sheet set, and duvet cover, we used Casper as well. Casper’s pillow-in-a-pillow was designed for all-night comfort, for every sleep position. With just the right balance of squish and support, the inner pillow is supportive, while the outer pillow adds a soft comfort. And when it comes to sheets, I am really picky. I like a cool, crisp feeling to my sheets, and these totally fit the bill. 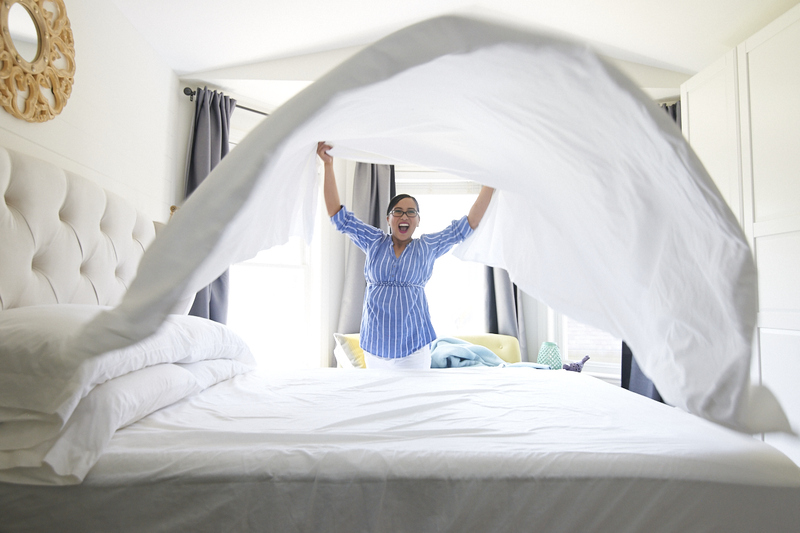 Casper’s cotton percale sheets are smooth, airy, and get softer with every wash. The breathable percale weave sleeps cool all night long, and we went with white to keep everything serene and peaceful. And again, convenience. The mattress and sheet set showed up within days of ordering, to Jenn's front door. So convenient. Once your bed is taken care of, designate a spot for the office. This could look like a stand alone desk, or like we did in Jenn's bedroom, custom millwork. I chose to go custom because I wanted to give Jenn every square inch of storage I could, and so fitting her desk in this nook by the window, and taking shelving to the ceiling, was the best plan for this space. The other amazing thing about going custom, is that we were then able to paint the desk this gorgeous turquoise colour, Benjamin Moore Waterfall 2050-50. When planning your storage options, definitely consider a combination of closed and open storage. 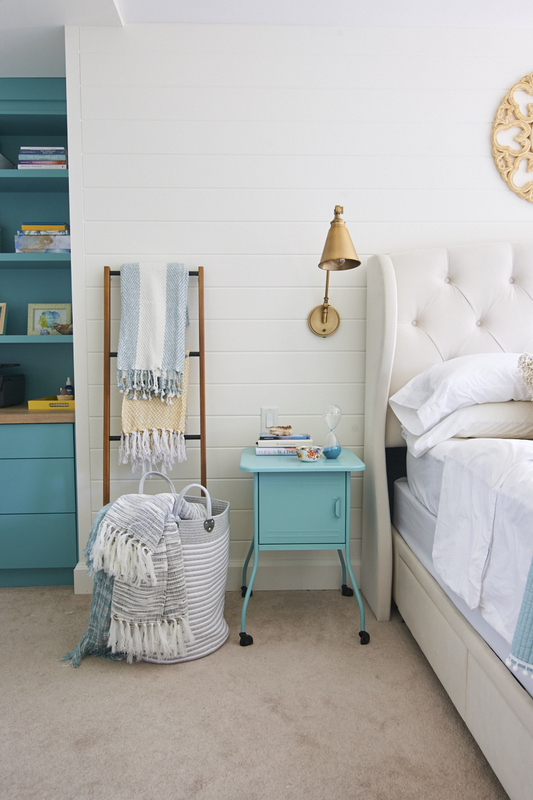 Closed storage is essential for hiding visual clutter, and in a bedroom this is so important. 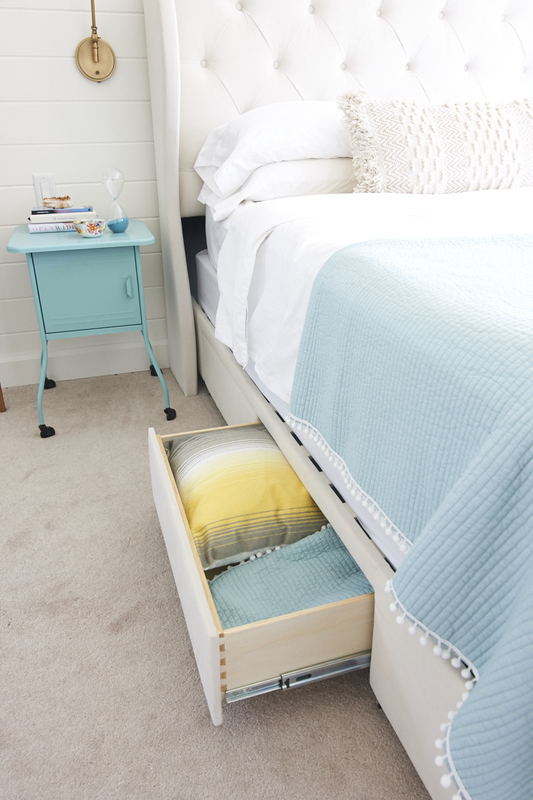 You need to be able to end the workday, without a chaotic mess next to your bed, and closed storage makes this possible! It's also important to have open storage, as this allows you to display the motivational elements and decorative items that remind you of your purpose, and keep a positive energy around you! And can we talk for a second about these brass, hand cast cabinet pulls? They are designed by a local Toronto entrepreneur Shayne Fox, and they like jewelry on this desk. I love them so much. And for the chair, let me tell you did I get educated on ergonomic health. Being almost 8 months pregnant, I basically suffer from low back pain all the time. And even more so when I am at my desk for long periods of time. THIS CHAIR IS A GAME CHANGER YOU GUYS. It literally felt like a hug for my low back and pelvis. The CoreChair is an ergonomic active sitting chair that provides optimal support while introducing movement into your workday- i.e. you kind of wiggle when you sit in it, which keeps the muscles active which is how we avoid all the low back pain. The low back support combined with an aggressively sculpted seat embraces your pelvis, positioning you to sit tall with optimal posture. With four levels of resistance, the tilting mechanism allows you to move up to 14 degrees in all directions, loosening up your joints, promoting blood flow and relaxing your tight lower back muscles in order to reduce pain. Seriously, this chair needs to be in homes and offices everywhere! And for someone like Jenn who promotes mobility and healthy living as much as she does, this chair was such a good fit. This is an important aspect of design to me, regardless of the kind of space you are creating. The space has to reflect you and your unique personality. Jennifer's personality is so vibrant- so I just had to add elements like this Metrie door painted Benjamin Moore Yellow Highlighter 2021-40. To ensure that this really was like the exclamation point at the end of a sentence, we kept the adjacent Metrie sliding closet doors in white to ensure some balance. 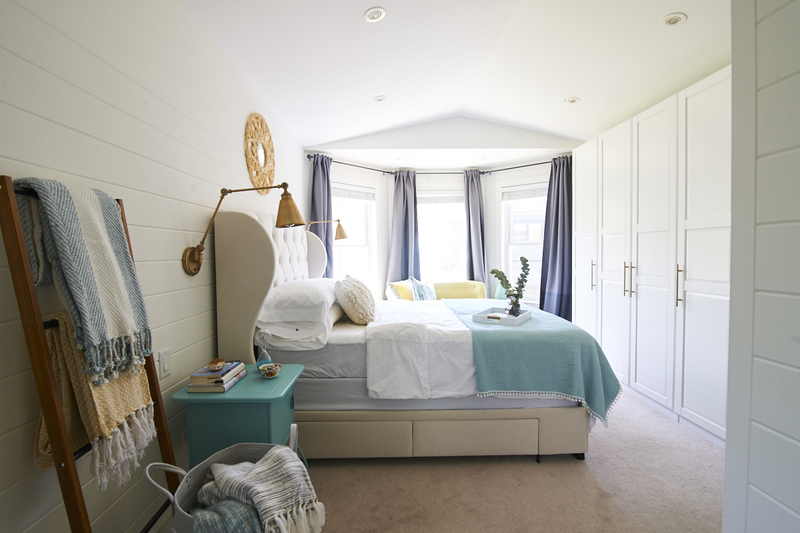 And again to ensure the space didn't feel too overwhelming with all the vibrant pops, I wrapped the room in Metrie's tongue and groove paneling and painted it out Benjamin Moore Decorator White CC-20. It's no secret how much I love interior mouldings. They provide such a beautiful textural element to a space. Metrie has been my go-to partner for architectural elements for years-their passion for design and innovation has allowed them to become the largest supplier and manufacturer of solid wood and composite moulding in North America. And of course a bedroom needs to feel cozy and comfortable, which is why I added ample blankets and pillows in a variety of textures – all within our colour palette to stay harmonious – and displayed them on this ladder from Bouclair. Lighting also makes a big impact in the room, with a stunning modern chandelier from Bouclair adding an architectural element. And of course you can add your personality in all the fun accessories. 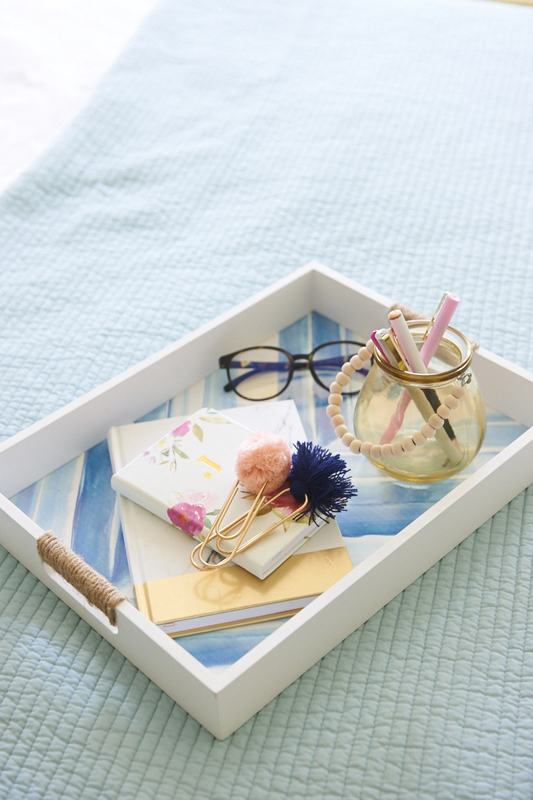 I picked up this tray and yellow pen holder at Bouclair, where it's not hard to come home with a carful of fun, well-priced accessories for your home. I love the painterly element of this tray and on trend rope detail. What do you think? Would you be productive in a space like this? Love to know in the comments below! Special thanks to all the brands mentioned who partnered with me on this project by providing products. I love working with brands who care about families thrive at home, and I do ample research to ensure and products I use will provide value to you!